The IQ Air Healthpro Plus is a very efficient machine. It uses HEPA filters and an activated carbon mixture to bring hospital quality air purification to your home or office. It retails for $900. The IQ Air Healthpro Plus uses a HEPA filter. IQ Air calls this a hyperHEPA filter. It is capable of removing 99.5% of particles 0.003 microns and larger. This means it is 100 times more efficient than a regular HEPA filter. This air purifier also use activated carbon and alumina. This is impregnated with potassium permanganate. This provides superb gas filtration. There is a pre-filter which is used to help the HEPA filter last longer. The pre-filter is very efficient. In fact, it is as good at removing particles as many other air purifiers. There is an optional pre-filter for the pre-filter you can buy. It attaches to the bottom of the air purifier. It has a washable foam filter. It can help you $60 pre-filter last longer. The pre-filter is about $60. It should last 6 - 18 months. The HEPA filter is about $190. It should last 2 - 4 years. The V-5 gas cartridge is about $90. It should last 1 - 2 years. The life of the filters vary a lot. It is difficult to know exactly how much it will cost to maintain the air purifier. We can make a few assumptions. Let's say the prefilter lasts 1 year, the HEPA filter 3 years, and the V-5 gas cartidge 18 months. This would give us an average cost of $180 each year. Actual cost will vary depending on the environment. A big advantage of this air purifier is that all the filters are separate. Each filter can be changed when it needs it without having to replace all the filters. This is a big plus in our book especially considering how expensive they are to replace. We would hate to buy a new filter when we didn't need to. The IQ Air Healthpro Plus is certified to clean up to 900 square feet. That's a room 30 feet X 30 feet. Although this machine is very expensive it isn't a a super machine. At a max of 260 CFM it only provides 2 air exchanges per hour. To get the recommended 6 air exchanges, it needs a space of around 300 square feet. Unfortunately, IQ Air purifiers are not certified by AHAM, so we don't know what the CADR number would be. Reguardless, this will remove an amazing amount of stuff from the air. The IQ Air Healthpro plus is a great machine and it will really filter the air. It is not going to go through a 1500 square foot area and clean it all over night. It will work very well in a smaller space. The biggest benefit we see in this purifier is that it really cleans the air. It works really well. The fan has 6 speeds and it is programmable. It can be programmed to run at different times of the day and at different speeds. The IQ Air Healthpro Plus measures 28 inches X 15 inches X 16 inches (H X L X W). It weighs about 35 pounds. Wheels can be added to it, but it is not easily portable. We feel that you should pick one place to put this and leave it there. It comes with a 5 year warranty that covers defects in parts and labor. Filters are not included under the warranty. The better question is what doesn't this remove. The IQ Air Healthpro Plus can remove a wide variety of particles from the air. If you are concerned about the quality of the air in your house and you can afford it, then this is the air purifier for you. It does an excellent job of filtering the air. Just remember, that just like any other air purifier, it works better in a smaller area with closed doors. 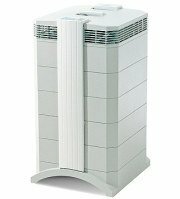 There are some other air purifiers that can clean a larger area. But this one is the best at removing particles from the air. It is the brand and many hospitals trust. We feel that anyone who can afford this purifier should buy it. The best benefit of this machine is that you get outstanding removal of allergens and asthma triggers. As a bonus you also get chemical and odor removal too. This is a great machine. Anyone with allergies or asthma would greatly benefit from this air cleaner. It will also help anyone with Multiple chemical Sensitivities. Bottom line: Anyone will benefit by having this air purifier. The cost of the machine is high. The cost of replacement filters is also high. This is NOT a cheap machine to use. If you aren't prepared to spend the money you should find another air purifier. If you don't mind paying for the best, this is the one you have been looking for. Leave IQ Air Healthpro Plus Page and Return to IQ Air Purifiers.